Who are BTS? Everything you need to know and watch the video for the group’s new single DNA! Think DNA should be played on Fun Kids Radio? Tell us in the comments! You might have seen a video trending on YouTube from a group called BTS. It’s the music video for their new single DNA and it’s already got over 100 million views! If you’ve never heard of BTS before and are wondering where they’ve come from, don’t worry cause we’ll tell you everything you need to know about the group below! BTS are a boy band from South Korea, who formed in 2013. They’re also known as the Bangtan Boys or Beyond The Scene. There’s seven (yep, SEVEN) members in the group – Jin, J-Hope, Rap Monster, Suga, Jimin, V and Jungkook. They’re a mixture of singers and rappers – and they’re all amazing dancers! The group was formed after auditions were held in 2010 and 2011. Yep, these guys are HUGE! They’ve sold 4 million albums worldwide, have over 6 million followers on Instagram and over 8 million on Twitter! But you might not have heard their songs before – because BTS sing in Korean they don’t get played as much in the UK but that could be about to change! In America, BTS have just become the first Korean group to have a Billboard Top 100 hit! The only other Korean pop act to have a song higher in the charts is PSY! What do BTS songs sound like? BTS songs tend to be a mix of hip-hop, R&B and dance music. And then their new single DNA sounds like a Calvin Harris tune! So yeah, each one’s quite different! What are BTS’ real names? Jin’s real name is Kim Seok-jin. He was born on December 4, 1992. Suga’s real name is Min Yoon-gi. He was born on March 9, 1993. J-Hope’s real name is Jung Ho-seok. He was born on February 18, 1994. Rap Monster’s real name is Kim Nam-joon. He was born on September 12, 1994. Jimin’s real name is Park Ji-min. He was born on October 13, 1995. V’s real name is Kim Tae-hyung. He was born December 30, 1995. Jungkook’s real name is Jeon Jeong-guk. He was born on September 1, 1997. What are BTS’ fans called? BTS fans are called the BTS ‘ARMY’ and they really love their group! At the 2017 Billboard Music Awards in the US, BTS walked away with the prize for Top Social Artist. They managed to beat top American artists like Justin Bieber, Selena Gomez and Ariana Grande. That because the ARMY cast a whopping 300 million votes for BTS to help them get the award! 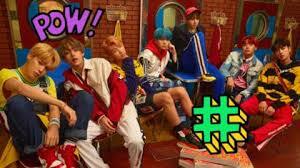 Are you a fan of BTS? Do you think DNA should be played on Fun Kids Radio? Let us know in the comments below! BTS are literally the best band you can get. They are funny, kind, cute, caring, and amazing singers and dancers. My bias(favourite member in the group) is Jungkook, and my bias wrecker (someone who sometimes looks better than you bias) is Min yoon gi. You should definitely become an ARMY if you enjoy listening to music. There are also many other kpop groups for example Got7, BLΛƆKPIИK, Stray Kids, Twice, Exo, Momoland, Wanna One, Bigbang, Shinee, Pentagon and many more.